The handle, or receptor, is located on cells that build cartilage, muscle and bone. Joints are filled with such cells, which helps explain patients' painful symptoms. Further, by creating decoy handles, the researchers showed that they could reduce chikungunya infection and signs of arthritis. "The name chikungunya comes from the Makonde language of Tanzania, and it means 'to walk bent over.' That's how painful the arthritis can be," said senior author Michael S. Diamond, MD, Ph.D., the Herbert S. Gasser Professor of Medicine at the School of Medicine. "We now know how chikungunya gets into cells, and we may have found a way to block the infection. If the virus cannot get into the cell, it is unable to replicate and cause infection and disease. Figuring out how the virus gets inside cells is considered a step toward slowing its spread. 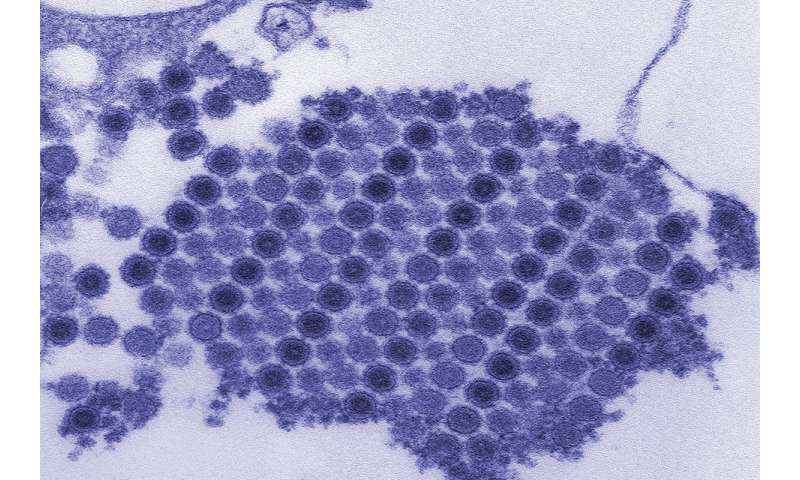 Diamond, first author and postdoctoral researcher Rong Zhang, Ph.D., and colleagues identified the protein on cells that chikungunya virus latches onto. The protein is called Mxra8, and it is needed for chikungunya to invade both human and mouse cells, the researchers found. Additional experiments showed that not just chikungunya but its arthritis-causing relatives—Mayaro, Ross River, O'nyongnyong and Barmah Forest viruses—require the protein to get into cells. Since chikungunya uses Mxra8 protein as a handle to open a door into cells, the researchers tested whether preventing the virus from grabbing that handle could reduce infection. They deluged the virus with decoy handles, reasoning that chikungunya would grab the decoy and be locked out of cells. Only the few individual viruses that lucked onto a true handle could infect cells, so the overall infection rate—and signs of arthritis—would fall. And that's just what they found. A day after infection, the level of virus in the mice's ankles and calf muscles was between tenfold and a hundredfold lower in the animals that had been treated with Mxra8 proteins or blocking antibodies than those that received placebo, and the numbers remained lower over the next two days. In addition, three days after treatment, the mice that had received the protein exhibited much less swelling in their ankles than those that received the placebo. "Not much is known about what Mxra8 does in the human body, so we need more information before developing a drug that targets Mxra8," said Diamond, who also is a professor of molecular microbiology, and of pathology and immunology. "But we could more immediately develop a drug that targets the virus and prevent it from attaching to this protein." The researchers are working on mapping the structure of the protein and locating the exact spot to which the virus attaches. Such information could help researchers design a compound to interfere with the virus's ability to hold onto the protein, or to design vaccines to prevent infection.